William E. McAuliffe is Associate Professor of Medical Sociology in the Department of Psychiatry, Harvard Medical School at Cambridge Health Alliance and the North Charles Foundation. He has been a professor at Harvard University since receiving his doctorate in social relations from the Johns Hopkins University in 1972. He was Phi Beta Kappa at Johns Hopkins in 1966, and one of his studies of heroin addiction was awarded the Socio-Psychological Prize of the American Association for the Advancement of Science in 1974. For 25 years, he taught Harvard graduate courses on substance abuse, research methods, health services research, and statistics. His research interests have focused on drug abuse, social research methodology and statistics, measuring the quality of medical care, health services planning, and drug abuse treatment and prevention. He has published well over 100 articles in scholarly journals, reviews, books, and book chapters. His early research concerned the role of positive and negative reinforcement in development of medical and non-medical opioid addiction. That work led to a series of studies of drug abuse by heroin addicts, medical patients, and health professionals. Also based on his theory of addiction, he developed a relapse prevention program for heroin and cocaine addiction, described in Recovery Training and Self Help: Relapse Prevention and Aftercare for Drug Addicts (Rockville, MD: National Institute on Drug Abuse, 1985 and 1993). Evaluated by a randomized clinical trial he conducted in New England and Hong Kong, it is one of only two relapse prevention programs currently listed by the Substance Abuse and Mental Health Services Administration's National Registry of Evidence-based Programs and Practices. He also developed an outpatient detoxification program for cocaine addicts: Clean Start: An Outpatient Program for Initiating Cocaine Recovery (New York: Guilford Press, 1992). Dr. McAuliffe has adapted the Clean Start program for use in conjunction with Vivitrol in the treatment of opioid addiction. His recent research and publications have focused on survey and indicator measures of the unmet need for substance abuse treatment services and on prescription drug addiction. He was director of the National Technical Center for Substance Abuse Treatment Needs, which provided technical assistance to all states as they implemented a telephone survey of substance abuse treatment needs questionnaire that he designed. Since 2007, he has designed and analyzed the state-added drug and alcohol treatment need modules for the Massachusetts Behavioral Risk Factor Surveillance Surveys (MA BRFSS). 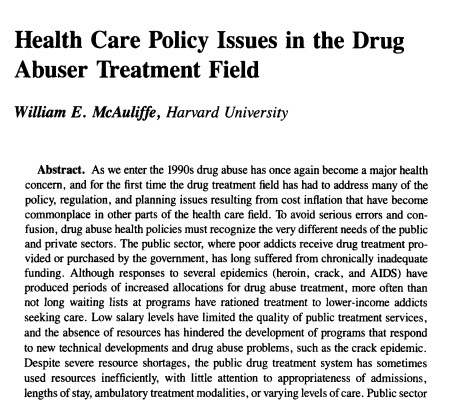 In 2013, he published a critique of research on the prevalence of iatrogenic opioid addiction and developed a new measure of it for the MA BRFSS. Analysis of the resulting data will be completed this year. Professor McAuliffe developed an algorithm for measuring the prevalence of substance use disorders from mortality and hospital discharge data. The measure led to publication of a series of articles describing interstate and substate variations in substance abuse treatment needs. Currently, he is updating the algorithm for a study of linked hospital discharge, mortality, and treatment admission data in Massachusetts. Dr. McAuliffe is also a frequent contributor to the open-source research library ResearchGate. If you would like to know more about Dr. McAuliffe's professional career, please see his CV.